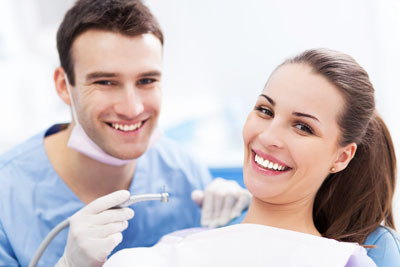 We can provide you with a dental restoration that is strong and durable. Whether you crack, chip or lose an adult tooth, dental restoration is the solution. We have a variety of cosmetic dentistry solutions we can use to do so, including dental bonding, dental veneers, dental crowns, a dental bridge, and dental implants. Regardless of which solution the patient selects, we will ensure it looks beautiful and natural. It will function as well as a natural tooth, giving one the ability to smile with confidence, eat favorite foods, and speak clearly. What one needs to remember, however, is that the restorations can sustain damage just like natural teeth. Thus, it is important to take steps to keep the mouth healthy and restorations in good condition. If one plays sports, there is a good chance that a runaway ball may collide with the face. Even if one only plays the occasional pickup game of basketball, an accidental elbow jab can lead to tooth damage. If an individual pays money for a dental restoration, the risk of damaging it is simply not worth it. A mouthguard is a simple, affordable, and comfortable way to protect the teeth. Oral hygiene is always important, even if one has restorations. Many people make the mistake of thinking that if they have dental crowns, they do not need to worry about brushing as much since the crowns surround natural teeth. While a crown may prevent anything from touching the tooth, the crown still surrounds a natural tooth with a root structure. If plaque builds up around the gums of any teeth, it can cause them to inflame and then recede. As they do, it can expose more of the tooth structure and roots, likely causing an infection, bone loss, and even tooth loss. Having a restoration will not prevent this. Good oral hygiene will, though, along with regular visits to our dental office for a teeth cleaning. We recommend you brush your teeth twice a day, floss daily, and have your teeth cleaned twice a year. If there is a chance that a patient is grinding his or her teeth at night, then the patient needs to wear a night guard. Grinding teeth can lead to jaw and face pain, but it can also cause damage to the teeth or a dental restoration to pop off. To protect oneself, wear a guard while sleeping. For more tips on how to prolong the life of your dental restoration, call us at (503) 248-1114 and schedule an appointment with our dental office.